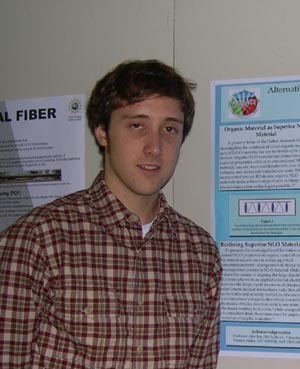 November 2003-Present- Undergraduate Research Assistant. Focused on the synthesis of novel NLO systems. Worked in the Dalton Research group with Dr. Yi Liao in the synthesis and characterization of a NLO polymer. Anderson, C., Liao, Y., Robinson, B. H., Dalton, L. R. “Alternating Polymerization of EZ-FTC and Bis-(3,5)-dibenzyloxybenzyl Alcohol to Improve Site Isolation of NLO Material.” 2004, CMDITR Review of Undergraduate Research, 1(1), 12. Cyrus is interested in pursuing a career in industrial research which applies organic chemistry towards the development of Hi-Tech devices. Vice President of the Alpha Pi chapter of the Phi Kappa Tau fraternity. Tutor at the UW Chemistry Department undergraduate study center. Hobbies: home brewing, restoring cars from the 1960’s, and fishing.